Sep 18, 2012 by Paul O'Connor 1 Comment Posted In: Say What?! Hank Pym is a mental case. With all his shrinking and growing, the poor Doc doesn’t know if he’s coming or going. I suppose he can be excused for getting confused when his secret supersuit closet contains duds for Ant Man, Giant-Man, Yellowjacket, and Goliath! 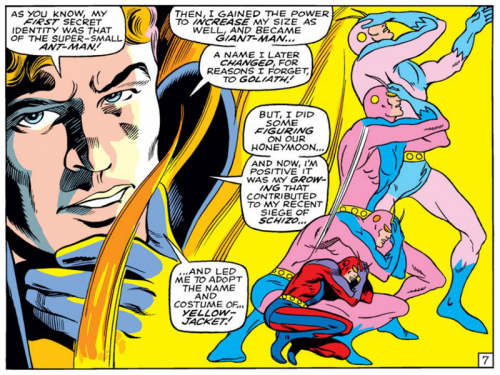 But if Doctor Pym himself can’t remember why he changed his name from Giant-Man to Goliath, how are we poor fans supposed to keep up?